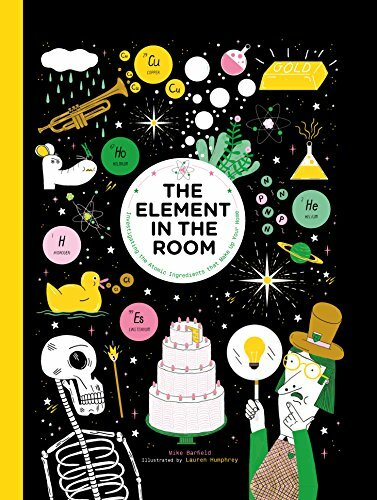 The Element in the Room is an intriguing mix of history of science with pure scientific facts, explaining the elements in general, the periodic table, and then individual elements. It's an odd combination but the use of clear graphic art by Lauren Humphrey and comic strips explaining shortened versions of scientific discovery work in bite-size portions. This isn't a book to be read in one sitting, but dipped into when the scientific mood strikes. For the science facts, readers will learn things like “When atoms of more than one element join together chemically the resulting substance is called a compound.” Or “Hydrogen makes up almost three-quarters of the total mass of elements in the universe.” Will these facts be comprehensible to seven year olds? Will second graders make much sense of these pages? It seems like a stretch, but older readers, closer to nine or ten, can get a lot out of the clearly explained concepts along with the appealing art. The part of the book that will be most widely read, however, are the “Atomic Comics” scattered all too rarely throughout (there are only ten). The first comic introduces the ancient Greeks and their concept of the four elements. The last one introduces splitting the atom and building the atomic bomb. The intervening comics provide a brief overview of humanity's understanding of the atom and elements, focusing on such topics as noble gases, alchemy, and electrolysis. This isn't a summary of the history of understanding atomic structure—though there are bits of that included, with a comic on Ernest Rutherford, the British physicist who discovered the neutron. The comics proceed more or less chronologically and provide snippets of information, more introduction that fully-told stories. We read that Wilhelm Rontgen discovered X-rays but don't learn how that happened. We read about various elements being discovered, but the discoveries themselves remain mysteries. How, after all, do you find an element? Perhaps the science behind that is too complicated for the intended audience. As it is, the book struggles to be accessible to younger readers. The pages on each element and where you can find it in your home are both interesting and plodding. For example, will anyone be interested to learn that “Elemental vanadium rarely occurs naturally, but vandium compounds are important in industrial processes such as making sulfuric acid”? This is more science than even an 11 year old will care about. But learning the reasons why bath water leaves a ring is much more appealing. The Element in the Room is a strange hodge-podge, but there are kids who will find it fascinating, others who will eagerly read some parts, and still others that will only read the comics. With the comics and the cleverly designed art, this book has something for everybody. And those with a keener curiosity will find plenty to satisfy their elemental interest.